The art experiments were produced in 1985 by Warhol under commission from Commodore - creator of the Amiga computer. The digital images were discovered and recovered by staff and students who are members of Carnegie Mellon University's computer club. The club was enrolled in the attempt to find and restore the images by self-confessed Andy Warhol fanatic and artist Cory Arcangel. He noticed Warhol's involvement in the Commodore Amiga launch thanks to a video uploaded to YouTube of the 1985 event. 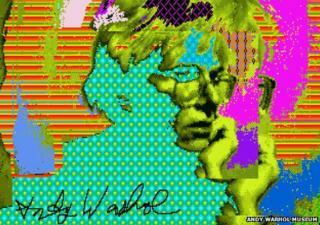 At the launch news conference, Warhol used the Amiga's graphics program to paint a portrait of Blondie lead singer Debbie Harry. Arcangel wondered if Warhol had produced any other works with the Amiga and contacted the Andy Warhol Museum in 2011 to get permission to search its collection. The search turned up an Amiga computer and lots of floppy disks and led Arcangel to approach Carnegie Mellon for help in cataloguing what was on the storage media. At that time it was not known if any Warhol works were on the old disks. Magnetic imaging tools were used to copy data on the disks so no damage was done to the original floppies. Examination of the copied data revealed several files that had titles such as "campbells.pic", "flower.pic" and "marilyn1.pic" that were reminiscent of Warhol's best-known works. Reverse engineering of the format helped to recover the images many of which turned out to be signed electronic facsimiles of Warhol's more famous creations. In total 18 images were recovered, a dozen of which are signed by Warhol. "What's amazing is that by looking at these images, we can see how quickly Warhol seemed to intuit the essence of what it meant to express oneself, in what then was a brand-new medium: the digital," said Arcangel in a statement. The discovery and recovery project has been filmed for a documentary that will be shown on 10 May at a public lecture at the Carnegie Library lecture hall in Pittsburgh. Soon afterwards, the documentary will be put online at http://nowseethis.org/.